The Department of Family Medicine (DFM) congratulates the Eau Claire residency program on its 40th anniversary and its 10th year partnering with Chippewa Valley Technical College (CVTC)—a milestone celebrated with an open house for the community served by this long-standing program. The Eau Claire program opened on July 1, 1974, and has since graduated 206 family physicians. Of those, 132 practice in Wisconsin and 51 practice in the Chippewa Valley. Program residents learn and practice at UW Health Eau Claire Family Medicine and at the nearby Augusta Family Medicine Clinic. They also collaborate with other regional health systems to care for patients and learn from specialists there. Ten years ago, the program also formalized its partnership with CTVC. Through that partnership, it provides health care services for CVTC students, and shares space with the CVTC Health Education Center, which has state-of-the-art equipment and human simulation labs used by CVTC students and Eau Claire residents. In the CVTC simulation lab—known as the Virtual Medical Center—residents learn to manage simulated trauma and emergency scenarios using chip-embedded mannequins. 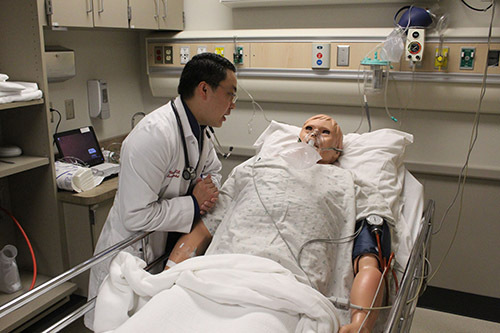 They also practice team-based care alongside CVTC students in nursing, emergency medical services, respiratory therapy, and other health care disciplines. For example, residents lead the team in assessing and caring for a simulated patient, who follows a scripted response to communication, medication and other interventions. The team then debriefs afterwards to identify what went right and wrong – an experience that mimics real life and prepares them for their future as a practicing physician.